I've talked before about many gamers' discomfort in mixing science fiction and fantasy. It's a discomfort I shared for a very long time, vestiges of which I still retain, despite my best efforts to eradicate it. I'm psychological predisposed to organize the world into nice, neat little boxes and the kind of gonzo fantasy exemplified by The Arduin Grimoire, for example, has always been a step -- or more! -- too far for me. As I said, I'm trying to overcome this prejudice of mine. I'm helped in this regard, because most of the authors who inspired the creators of D&D didn't share this prejudice and gleefully mixed genres if it allowed them to tell a good story. 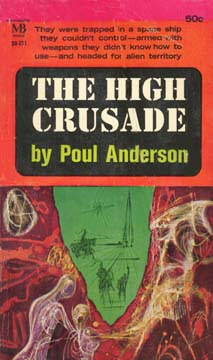 Poul Anderson's 1960 novel The High Crusade isn't technically a genre bender. Strictly speaking, it's a work of science fiction, specifically alternate history, because it postulates an encounter between extraterrestrial beings called the Wersgor and medieval Englishmen in the year 1345. The Englishmen, busy fighting the Hundred Years' War, mistake the alien scout ship for a French strategem and attack it, overwhelming and killing all but one of the Wersgor, whose technological sophistication made them unused to experiencing any resistance from primitive natives, let alone melee combat. The Englishmen, led by Sir Roger de Tournville, realizing that the scout ship, which they rechristen Crusader, could be a powerful weapon in the war against the French, force the surviving Wersgor to take them across the Channel to strike a blow for King Edward III. Instead, the alien launches the ship into space, its course set for the Wersgorix Empire, where he hopes he can be rid of these troublesome primitives. Unfortunately for him, things don't go quite as planned and, before long, the Englishmen wind up conquering a world on the frontier of the alien empire, which emboldens not only Sir Roger, who now dreams of defeating all the Wersgor in the name of his king, but also enemies of and dissidents within the empire, who come to their aid. In short order, a grand crusade across the stars is launched under the leadership of medieval Englishmen far away from home. To say that The High Crusade is implausible is an understatement, but Anderson, as he usually does, spins the tale so amusingly that it's hard to worry about such things. Instead, what we get is a well-told tale of a clash of cultures, in which the worldview of the medieval Englishmen is nearly as alien to modern minds as is that of the Wersgor. Strangely, I've always liked this novel, but that's probably because I like most things Poul Anderson wrote. Once upon a time, The High Crusade was a favorite amongst fantasy gamers, who regularly made references to it. The late, lamented Ares magazine published a wargame based on the novel in 1983, designed by David Cook. I never saw it myself and am considering acquiring the Ares Magazine Archive so that I can take a look at it and several nifty games published in the pages of that august journal. There was also, I just learned, a movie version of the book, produced by Roland Emmerich. Needless to say, all reports indicate it was a terrible film. A pity, because the book really is a lot of fun. This, along with "Three Hearts and Three Lions," is one of my favorite "early influence" novels. The peanut-butter-in-chocolate mixing of science fiction and fantasy never bothered me and, in fact, was always a possibility in my AD&D games, albeit rarely actualized. Perhaps this is one reason I was attracted to early versions of GW's Warhammer setting. Let's try that again, but in legible English. I just ordered "High Crusade" (on the strength of the so-bad-it's-good film and how much I loved the "Flandry of Terra" series) and the Karl Edward Wagner "Kane" books the other day. I think Brian Aldiss scifi/chivalry mash-ups as "Hooves on the deckplates" or something. Seems they were a popular variation on 'sword and planet' back in the late 60s. Strangely, I've always liked this novel, but that's probably because I like most things Poul Anderson wrote. Once upon a time, The High Crusade was a favorite amongst fantasy gamers, who regularly made references to it. Interestingly this is one of the few Anderson novels I've read. It's a grand romp and easily one of the most fun books someone in the SCA (which applies to both Anderson and me) could enjoy. @ Chris: I'm not sure the story is by Aldiss, but is a section in his great anthology Galactic Empires somewhere in volume 2. The story I always remember from that part is "Tonight the Stars Revolt" by Gardner Fox. I highly recommend this anthology to any budding Traveller player and that story in particular to any science fantasy fan (it's my favorite story in volume 2). I just read this book a few weeks ago and loved it. Not because the writing was spectactular or anything like that - if anything, it was a rather lackluster type of book common from that time period - but because of the attitude that just tickled me to death. Technologically advanced aliens arrive on Earth in a scout ship to begin the conquest of the planet, and are halted by a small group of Englishman who then proceed to use the captured ship and other resources to conquer much of the galaxy. I've always felt that Anderson had an even softer spot for the English than Tolkien ever did. I was going to reread this the other day but I couldn't find it on my bookshelf and read Three Hearts and Three Lions instead. I guess I'll have to look for it again. It is a great little book.